The monthly ArtSmart Roundtable brings together some of the best art-focused travel blogs to post on a common theme. This month we are discussing Art Cities. Below you’ll find a list of all the stories! This month we also welcome a new member, Lizzie from WanderArti! Her blog features handy city art guides and profiles contemporary artists who are inspired by travel. Be sure to check out her site! You’ve got to love excellent urban planning that gives you stunning views like this. I travel all over the world looking for artistic wonders and historical places, but to be fair, I actually have it really good back home. I live in Washington D.C. and it is a lot more than just the political capital of the US. It is also a world-class art, culture and history destination. 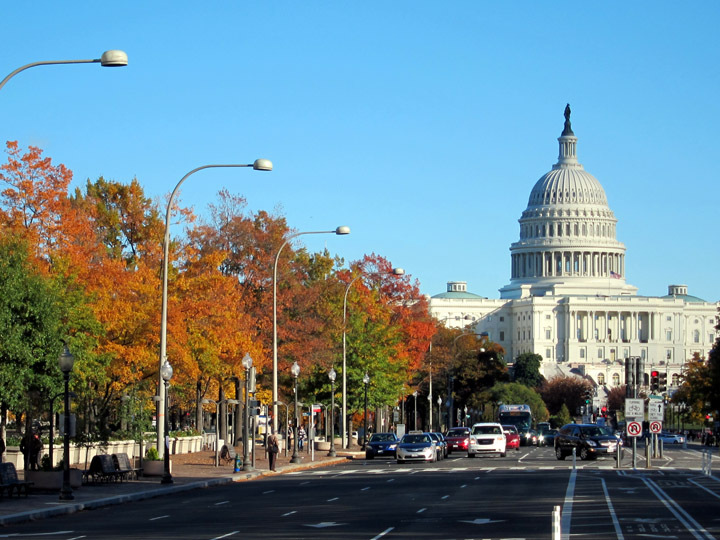 From the museums to the architecture to the festivals, Washington DC is a wonderful place to live and to visit! 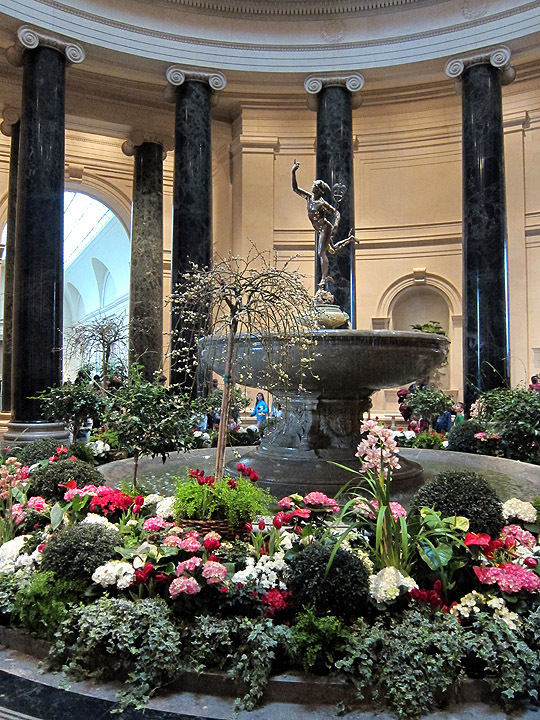 Rotunda of the National Gallery of Art filled with spring flowers. 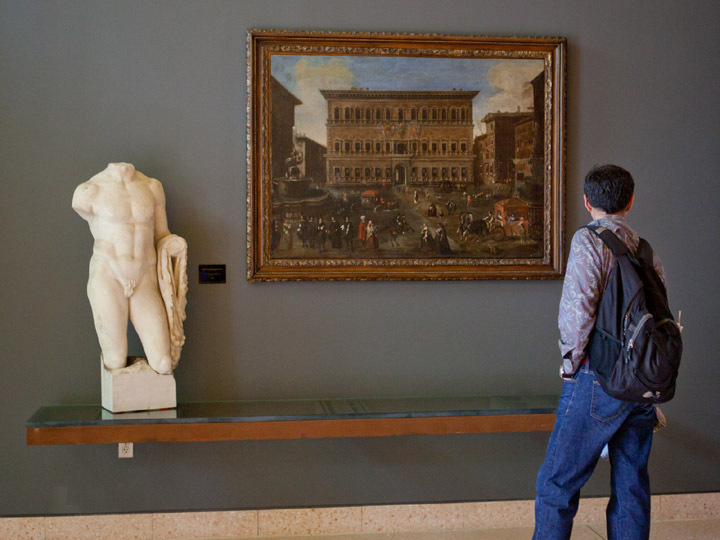 The first stop in D.C. for art lovers is the National Gallery of Art. Anchored by the collection of Andrew Mellon, this museum has an extensive Dutch, Italian Renaissance, Baroque, Impressionist, and American art galleries. The “must-see” pieces include Da Vinci’s Ginevra de’ Benci, several panels from Duccio’s Maesta Altarpiece, James McNeill Whistler’s Symphony in White, and John Singleton Copley’s dramatic but enigmatic Watson and the Shark. The East building which was designed by I. M. Pei houses more modern artists like Matisse and Pollock. 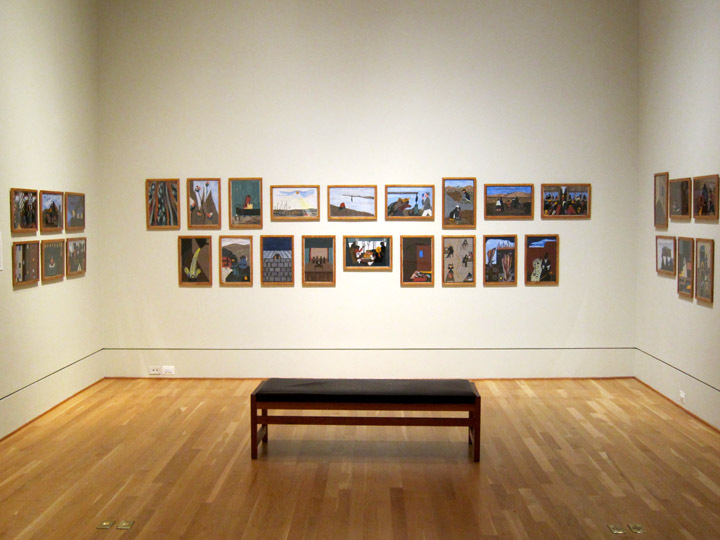 The NGA also hosts lectures, movies, concerts, and studio art days for all ages. 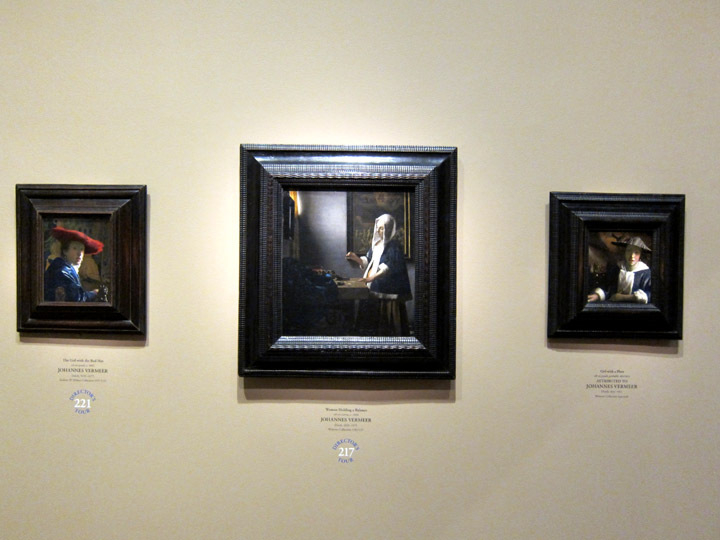 This wall of Vermeers is isolated from the rest of the Dutch Galleries which means it is often missed by most museum visitors. So if you know to look for them and follow your map of National Gallery of Art, you may end up alone with these incredibly detailed paintings. Washington D.C. also has a network of art museums administered by the Smithsonian Institution which is now also part of the U.S. government. The Freer and Sackler Galleries focus on Asian Art. The National Portrait Gallery elegantly bring to life modern, historical, average and famous Americans. I particularly like the Hall of the Presidents which has an official portrait of each President ranging in style from Norman Rockwell’s Nixon to Elaine de Kooning’s Kennedy. Smithsonian American Art Museum pulls examples from America’s varied art movements. I particularly like their evocative landscape paintings which document an age of exploration into the untamed western frontier. The Hirshhorn Museum is dedicated to modern and contemporary art. 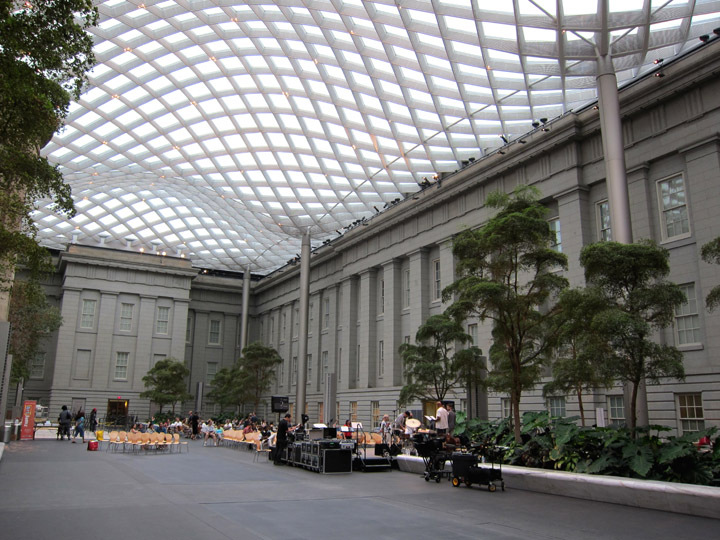 National Portrait Gallery and Smithsonian American Art Museums are co-located and share this inner courtyard where weekly concerts are held. Cities can be defined by their architecture. London is Georgian, Paris is Belle Epoque, and D.C. is what I refer to as “thick neoclassical“. There are a lot of administrative buildings in the heart of Washington constructed using Greek and Roman elements and thematic motifs but with a sturdy, monumental quality. Since many of these buildings date to the 1920’s and 30’s, this uniquely D.C. style is likely neoclassicism influenced by art deco and Depression-era social realism. Washington’s residential areas tend to be elegant Victorian row houses. Some are plain brick, some are painted. In some neighborhoods, they are more decorative and in others they have comfortable, inviting porches. Thankfully many of these row houses have been granted historical status and must be maintained as constructed. For those that have been torn down, D.C. has a building height restriction (nothing can be taller than the Capitol) and so the authentic neighborhood architecture will never be lost beneath towering skyscrapers. As a result, DC has some amazing areas for strolling and a simple skyline that is unlike to change. 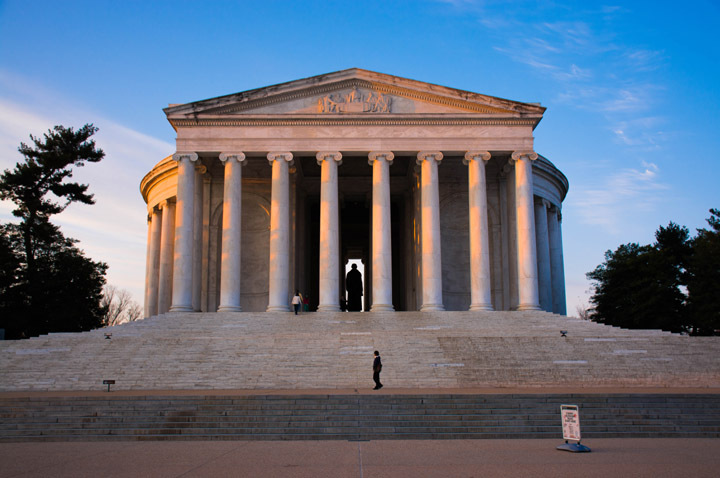 As the U.S. capital city, Washington D.C. has many public monuments and memorials. On one end of spectrum, the Jefferson Memorial and Lincoln Memorial are open spaces for gathering and enjoying the unique views amid inspiring political quotes. Alternatively, the Vietnam War Memorial is a somber and emotional monument to a great American loss. 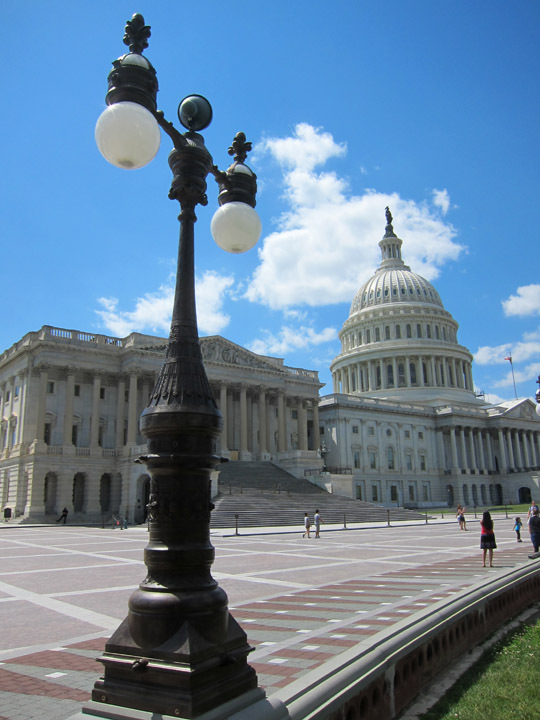 Beautiful street lamps around the U.S. Capitol. In assessing the artistic merits of any city, you have to look at the details. D.C. does an excellent job of styling lampposts, park gates, and even security fences to match the surrounding architectural design. There are also little creative touches if you look for them. Local artist have turned hundreds of obsolete fire department call boxes into unique mini-galleries. 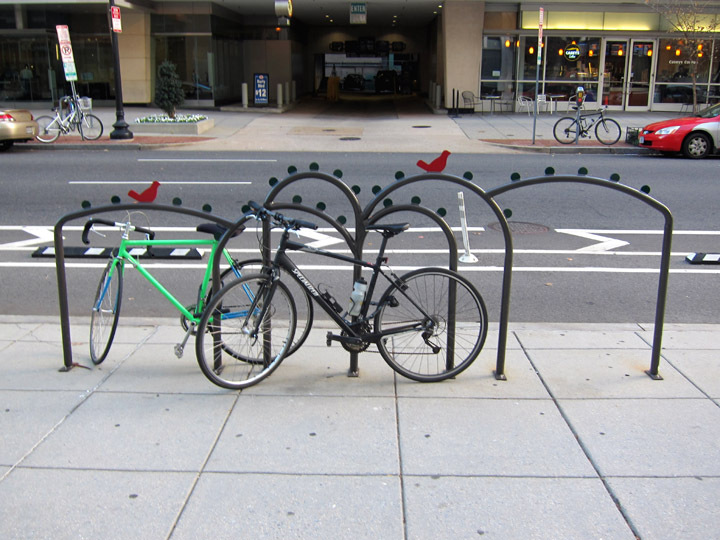 I also really like the creative bicycle racks scattered throughout the Foggy Bottom business district. This bike rack decorated with birds and stylized leaves on L Street near 21Street NW is one of my favorite little art pieces in the city. While DC has lots of arts, cultural and music events, the one you cannot miss is the annual Smithsonian Folklife Festival. Now in it’s 48th year, this free festival was designed to showcase and help preserve contemporary artists and craftspeople who are keeping their cultural traditions alive. 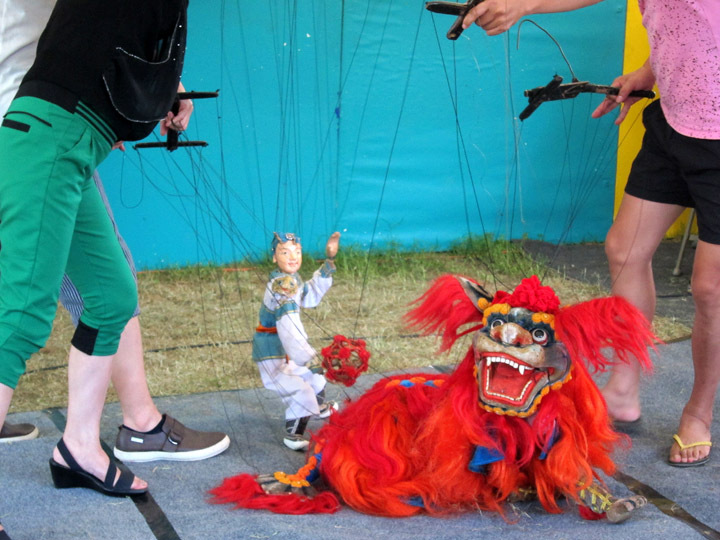 The annual festival usually focuses on a few countries or regions such as China and Kenya in 2014 and Hungary in 2013. This year the festival focuses on Peru and will be held June 24 – June 28 and July 1 – July 5, 2015. I’m really looking forward to it! Washington D.C. is also plugged into the greater international community. The Embassies host art exhibits, lectures and concerts. In my experience, the Italian, Spanish, and Germany Embassies are particularly good at holding events and showcasing their art. 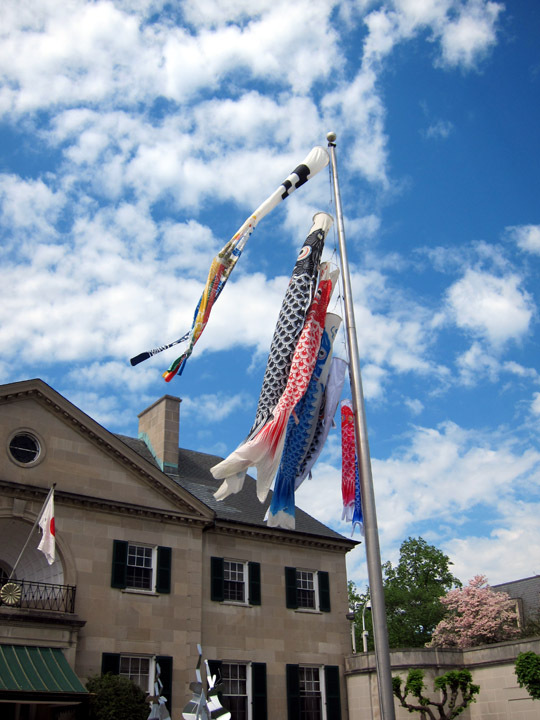 Fish windsocks at the Japanese Embassy. The Embassies also open their doors once a year to let D.C. residents experience a little of the nation’s culture. This year the “Around the World Embassy Tour” will be May 2, 2015 and the “European Union Embassies’ Open House” will be May 9, 2015. These are incredible events! When else would you be able to watch a dance performance in Thailand, see colonial art in Peru and hear folk music in Latvia all in the same day? There are still so many more things I’m leaving out! For the performing arts, D.C. has a Tony-award winning Shakespeare Company, several regional theaters, an Opera formerly headed by Placido Domingo himself, and the Kennedy Center for the Performing Arts. There are several beautiful historic homes and small museums including Dumbarton House, Dumbarton Oaks, and the Old Soldier’s Home. There’s so much to see; I live here and I still haven’t seen it all! And don’t forget to like our ArtSmart Travel group on Facebook for art & travel news! Thanks! Well, there’s always next time. Have a great trip back to the States! It’s seems like it’s been a while since you were back. Thanks! I hope you can swing through DC sometime. Excellent article, Christina! I would so love to visit DC to see all of this. Also very good to know that most of the museums are free, I really like that approach. Thanks Lydian! I’m spoiled living in DC with all these free museums 😉 There are also free daily concerts at the Kennedy Center. DC’s not only a great place to visit but much cheaper than New York. Thanks for the welcome Christina! I’ve only been to New York in America so there’s still so, so much of it I need to see. Washington DC looks incredibly arty and has just this minute jumped right up my list! I really enjoyed Washington D.C. but the last time I was there was about 17 years ago. I’ll take my kids one day (I’m already looking forward to the National Gallery!). Thanks Lesley! There is definitely a weeks worth to see. Cherry blossom season is one of the nicest times to visit DC 🙂 Hope you can make it soon! Really great list of impressive events and galleries/museums! I have yet to go. The only place I’ve been in the East USA is New York for a brief fast paced 5 days without getting to experience any galleries. Always a reason to return. Coming from the west I really appreciate how many great galleries there are.